JHARKHAND. FOR most, the word conjures up the happy image of a fledgling state finding its feet. But for the indigenous people of Saranda it has come to signify an unending struggle to save their way of life and habitat. Worse still, the authorities solely blame the tribal communities for felling trees and illegally settling in forests in the region even as the timber mafia and rampant iron ore mining are said to be the real culprits. Once said to be the largest sal forest in Asia, Saranda today is littered with dead trees - jharkhands in local parlance - that bear mute testimony to the blatant deforestation in the area. Taking a cue from nature itself, the local inhabitants now also call every new village settlement a 'jharkhand,>/I>' symbolising their intense desire for self-rule. Spread across 700 hills, the 4,526 square-kilometre (sq km) area in West Singhbhum districtwas once home to a vast treasure of biodiversity, including the highly endangered giant squirrel, and a large group of indigenous people - the Kols or the Hos. It has lost 32 sq km of forest cover between 1997 and 1999, according to Forest Survey of India (FSI) reports. "Saranda is finished," sighs Ram Dayal Munda, former vice chancellor of Ranchi University, squarely blaming "timber smuggling, political games and iron ore mining". The decaying forestland has also taken a toll on Saranda's indigenous people, who constitute 55 per cent of the total tribal population in Jharkhand. The adivasis, who feel their rights and culture are under threat, are on a collision course with the government. To begin with, they are vehemently against replacing their traditional mankimunda system (see box: Tribal self-rule) with the panchayati raj set-up on the grounds that the former is similar to the latter. "They have almost taken away our rights. We are treated like thieves in our own homes. We have to constantly bribe officials," says Sukhram Sandil of the Van Suraksha Samiti Kolhan-Porahat Manki-Munda Sangh. "First let them straighten out these things. Give us schools and hospitals. Give us irrigation. These are the priorities. Not panchayat elections," he adds. Jharkhand chief minister Babulal Marandi concedes that there is not much difference between the two systems, but adds that in the scheduled area panchayats immense powers are vested in the gram sabhas (see box: Face-off: differing opinion on major issues). "The panchayat elections will be held all over the state in the last week of April 2002. I am confident that the poll process will be peaceful in this region," he says optimistically. The government's decision to ban the sale of handia, a local brew, has also raised the indigenous people's hackles. On the other hand, the adivasis, too, are being held responsible for illegally settling in the forests and denuding them. The administration accuses the tribal communities of harbouring Maoist Communist Centre (MCC) activists as well. The air of distrust is thick. The adivasis today look at an outsider with suspicion. What makes matters worse is the fact that very few government officials have actually visited the forest interiors. "It is not that we want to cut trees," explains Sukhram Tanti Munda, head of Karampada village, "but since we have neither work nor money, we are left with no alternative." In fact, the task of cutting and selling trees is fraught with risk. Once a tree is cut, it is made into sleepers, which are surreptitiously transported out of the forest. Those caught in the act are put behind bars by forest department (FD) officials. For each timber sleeper worth at least Rs 1,500 in the market, the adivasis make a mere Rs 200 - that too on a good day. The presence of mines (see box: Red alert) hasn't benefited the adivasis either as "95 per cent of the labour is got from outside", points out Rohini Prasad Mishra, a resident of Gua. Consequently, many natives have been forced to "migrate to neighbouring states," says Mora Munda, head of an organisation called Khut-Katti Sangh Bharat Jana Andolan. Those left behind eke out a living by selling vegetables, herbs, firewood, roots and minor forest produce. The real culprits in this saga of exploitation, sources reveal in hushed tones, are the timber merchants (locally known as the "mafia") and some politicians. "Political leaders got people from outside and settled them in the jungles," says forester Mangda Gudia. "This was also the time when the Jharkhand movement was at its peak, and the politicians played the solidarity card to the hilt. The forest, meanwhile, was being cleared steadily to make way for human settlements." 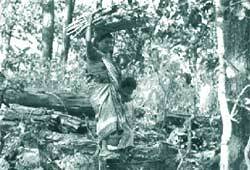 According to H S Gupta, divisional forest officer (DFO), Saranda, deforestation in the Kolhan division began in the second half of the 1970s, and by 1980 Saranda was fully occupied. "The abolition of the thekedari (contractor) system also had a hand in the destruction of Saranda, as the bitter thekedars did their best to destroy the forest." The fact that the settlements were made by felling sal trees and not the more valuable teak plantations is noteworthy. This, according to forest officials, shows commercial interest and "although tribal communities are involved in cutting the trees, the money is made by the timber merchants who reside in the towns", explains Kiriburu-based forester G S Munda. "Fed up with the exploitation and broken promises, the tribal communities started chopping down trees as a form of protest to teach the government a lesson," avers Father Stan Swami, of Johar, an organisation associated with the tribal communities in West Singhbhum district. "The region has a long history of protests, and the felling of trees in Saranda began when it was declared a reserve forest in 1882," says Mora Munda. "The adivasis living inside the forests were evicted without proper compensation and were forced to move on to Porahat, Palamau and Gumla." Some indigenous people were, however, settled in Saranda by the FD, explains Gupta, as there weren't enough officials to look after the forests. "These daily wagers were mainly engaged in protecting the woods against forest fires, digging trenches, making roads and working in rest houses." The tribal communities settled by the FD were also given khut katti rights, which enabled them to collect firewood and timber for domestic use. "In addition to this, they were allowed to clear some land and use it for agricultural purposes for three years. At the end of three years, another patch was allotted to them. This process was called the jhum cultivation," explains Mora Munda. "The land that had been cleared was used by the FD to plant the more economically valuable teak," he adds. This added fuel to the fire, "as the mundas have traditional ties with the sal tree and they resented teak being planted in its place", says Anuj Kumar Sinha, a Jamshedpur-based journalist. In 1978, the Jal, Jangal, Jameen (water, forest and land) movement also picked up steam. The tribal communities started demanding ownership of their land, water and forests. Under leaders like Devender Majhi, they started returning to the jungles of Saranda in what was called the Jangal Kata Andolan. "This is our land. And the tombstones bear witness to the fact," points out Mora Munda. Technically, however, the adivasis have no proof of even being citizens of India. This process of settlement, or 'encroachment' in the view of the FD, was at its peak during the early '80s and triggered a great deal of violence and bloodshed. From 1978 to 1985, there were 20 cases of police firing. The issue was taken to the Supreme Court (SC), which asked the state government not to misuse its powers and provide proper justice to all those arrested. However, villagers allege that nothing was done. Even today, members of the tribal community are frequently arrested - sometimes to cover up the crimes of the timber mafia. On their part, some forest officials pass the buck to state minister for tourism Joba Majhi, whom they accuse of playing political games. The highly inadequate staff, a fund crunch and a poor conservation strategy only compound the problem. "We have only 30 people manning an area of 850 sq km," laments the Saranda DFO. With a fresh government at the helm, the flow of funds has improved, says the deputy commissioner of West Singhbhum. "But there's no infrastructure to spend it on," he adds. The DFO, however, claims that efforts have been made to provide employment to the indigenous people in a couple of villages. "The government is also considering a JFM (joint forest management) proposal for these villages and the World Bank, which is already linked to some projects here, seems interested in increasing its involvement." But as Saranda is also a proposed site for the Union ministry of environment and forest's (MEF) Project Elephant, conflicts are only likely to increase. And this does not augur well, either for the future of the reserve forest or that of its natives.